Video of our week spent camping in the Lake District, a few days on The Quiet Site on Ullswater and a few at Eskdale Campsite where we climbed Scafell. Read the three blog entries for more details. After a wet few days in the Lake District the weather was set to improve and, rather than head up to Scotland as planned, we decided to stick around for the last four nights of our holiday. The Eskdale campsite, an hour or so to the west of Ullswater, promised walks from its doorstep and boasted three local pubs. It was bookable online too and so in a couple of minutes we had a new plan. We woke up on our campsite base of the last four nights to a gloriously blue sky we'd not seen all week, discovering we had a perfect view of Ullswater now the mist had cleared. Since we'd packed up our drive-away awning the evening before we didn't have much to do before setting off to our new camp. For our stay on the Quiet Site in the Lake District we travelled with our drive-away awning which is a huge beast both erected and stowed in its bag. Storm Brian was about to hit the UK and Google told of 48mph winds in our location but we decided to risk putting up the awning. It was either that or have it in the already-small living space in the van with us. During the first two nights Storm Brian blew a gale and I didn't get much sleep worrying about the awning taking off. It blew around noisily but, thankfully, remained pegged to the ground. With a rainy week in the lakes the awning gave us the space we needed to dry our soggy clothes. We moved the oil-filled radiator between the van and awning depending on where we were sitting, but in the end most of our evenings were spent in the campsite bar. Last October we headed down to the south of France for some late summer sun. We packed completely different clothes this year for nine nights in the Lake District. Our first base for the holiday was the Quiet Site on Ullswater. Sitting in the hills on the west side of the northern tip of the lake, about a mile from the water, pitches on the Quiet Site have jaw-dropping views across Ullswater and the surrounding hills. Due to the mist and rain it actually wasn't until we awoke on the final morning that we realised the lake was in view - but first thing on a sunny morning, with the sun just rising over Ullswater, what a view it is. This weekend we stayed on a National Trust campsite in the Peak District. It's a small, 20-pitch campsite in the grounds of National Trust property Ilam Hall and it proved to be an ideal base for a day's hiking in the hills. Tony and I were camping with friends Jules and Pete in their campervan Daisy and we arrived on site within a couple of minutes of each other at just after 6pm. We were booked in by a lovely lady whose husband then helped us to pitch on rather waterlogged ground, providing Jules and Pete with makeshift leveling blocks comprised of a few pieces of wood, and guiding us onto our plastic ones. If you've read much of this blog you'll know Tony and I don't think much to the club campsites of the Caravan and Motorhome Club or the Camping and Caravanning Club. Yes, you know what you're getting, and that includes great facilities, it just doesn't feel like camping. One of the reasons we continue to be members of the clubs is access to more than 3,500 CLs and CSs. That's Certificated Locations (Caravan and Motorhome Club) and Certificated Sites (Camping and Caravanning Club). These are small sites that are allowed five caravans and motorhomes at a maximum. They may also, if the choose, allow up to an additional ten tents. CL and CS sites are usually in out-of-the-way, rural locations, often attached to a farm or country estate. Since we travel in a campervan we're a little more restricted in our options as we need toilet and shower facilities, but some of the CL and CS sites provide these basics. We love Brighton but the campsite on the edge of the town, Caravan Club site Sheepcote Valley, leaves much to be desired. So we were delighted to discover Housedean Farm nestled in the South Downs and just over an hour's cycle from the centre of Brighton. The site is just off the A27 between Falmer and Lewes and we turned off just before those traveling all the way into Brighton itself would become stuck in the nightmare that is Brighton's snail's pace traffic. We were allowed to choose our own pitch and all have great views across the hills. It's a hilly campsite and you'll be hard pressed to find a pitch that's completely level, but we travel with levelling blocks and achieved a nearly spirit-level standard position. Although the views are rural, you can hear the hum of the A27. The beautiful Yorkshire Dales was our Bank Holiday weekend destination, far further north than we'd usually venture, and we booked in at Catgill Campsite, found through Cool Camping. We arrived at 1.30pm on Friday and grabbed one of the last level pieces of ground. The site continued to fill up with campers and around half of the tents and campervans had to pitch on sloping ground or squeeze in ever more closely to other camping units. We perched ourselves on top of a hill with space for another unit either side of us. Our two neighbours arrived before sundown and it felt cosy but not uncomfortable. The campsite has stunning views and great facilities and on a less busy weekend could probably be recommended. On August bank holiday though, it was overfull. Just four showers in the men's block was woefully inadequate for that many campers and we opted to get up at 7am rather than queue for ages later. This image shows the state of the refuse bins by Monday morning. Having been as far south as central Italy on our three-week campervan road trip we were on our way north again and our final stop before home was Colmar. 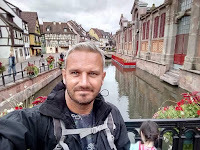 We'd previously enjoyed a week-long city break in nearby Strasbourg and Colmar promised similar with its 13th century Renaissance and classical architecture. Huttopia's Camping Indigo chain has a campsite in Colmar and it's a chain we trust implicitly. We thought nothing of booking for three nights. Wikipedia will tell you Colmar is one of the driest cities in France, but when we arrived the site was wet and muddy. We pitched as best as we could so we weren't sitting outside in a wet bog. Our pitch had a view of the river L'ill. We were midway between two facility blocks, one of which was clean and new and the other dated and grimy. The site is two kilometres from the historic city centre of Colmar and suffers road noise and sound from the nearby industrial areas. We found the northern end of Lake Como, where we camped four five nights, to be pretty good for cyclists and hikers alike. We were based in Sorico and cycling to the east and anti-clockwise around the lake was enjoyable, with the terrain mostly flat and cycle lane almost all the way. The only times we had to use a busy road was across bridges. Heading anti-clockwise from Sorico we found a quiet stretch of beach with two small coves where we were completely alone. You'll cross two rivers flowing into the lake, following cycleway parallel to the second river into some woods, where just before Colico Piano there's a small path to the lake edge and the larger stretch of beach. Lock up your bikes and walk to the right and you'll find two smaller and coves just across a grass clearing. We spent a quiet afternoon laying on the beach here with an occasional dip in the lake to cool off.